Access Windows Desktop icons without minimizing anything : PC Tips ~ My Media Centers-PC & Android Games & softwares,Movies, Tips And Tricks & Much more.. If you keep your most frequently used files and shortcuts on the Desktop, you can quickly access those icons by adding a Desktop Toolbar to your Windows Taskbar by following the below steps. In the Taskbar and Start menu Properties Window, as shown below, click the Toolbars tab. 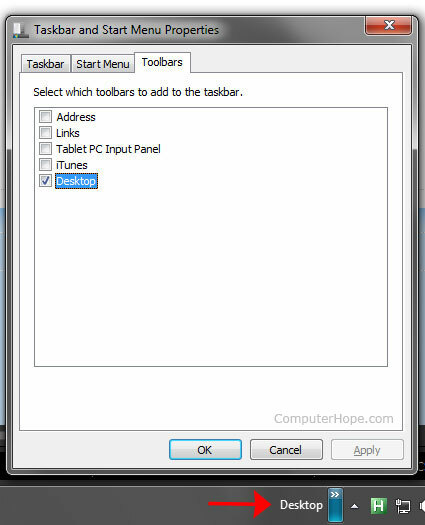 In the Toolbars tab check the Desktop checkbox and click Apply. Once the above steps have been completed you should have a Desktop option by the Windows Notification area of your Taskbar, which is also shown at the bottom of the below picture. After the above steps have been completed, click the chevron arrows next to Desktop will display all shortcuts and files stored on the Desktop.